When it comes to advertising and brand name exposure, nothing gets more bang for your buck than graphics applied to the exterior of your vehicle. We use top-quality vinyl for our vehicle graphics, which ensures long life and great visibility. From lettering to logos, Imagine That Media can help you out. We also make magnetic vehicle decals for temporary decorating. Magnetic signage is great for personal vehicles; go from corporate to casual in one easy step! Custom license plates are also available and are made-to-order. Imagine That Media can produce decals for almost every need. Custom full colour decals for indoor and outdoor use, automotive supply decals and even floor graphics! We can also do bar coding and consecutive numbering decals. Quick turnaround on many products available. All colours of vinyl are available. 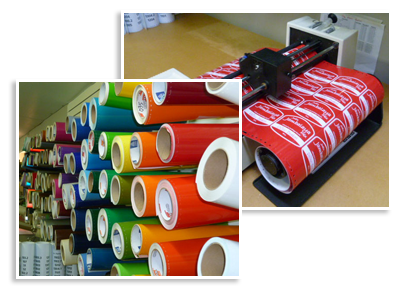 Ask us about our unique vinyl products for your next project! We offer full graphic design services on all our products. Help us welcome the Stickies, ITM's newest family on the block. Family vehicle stickers to represent every member of the family including the dog. Sold individually so you can build your own family. Ready for pickup in 1-2 working days. ​Available for pickup at 1636 Quebec Avenue in Saskatoon or $10.00 to ship to your location.